Visual content is critical for driving engagement on your church’s social media channels. The goal of posting on social networks is to get people commenting, liking and sharing … and people love visual content! In fact, Facebook’s EdgeRank system that decides what content ends up being viewed by people favors images and videos. 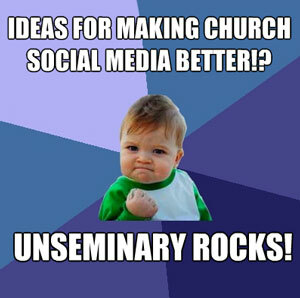 If you want people to interact with your church on Social Media you need to be generating visual content. Here are some simple and quick ways to generate visual content that people will love! Infographics // Have some stats you’d like to share with your community? Infographics continue to be a compelling format for communicating dry data in a fun way. Let the images do the talking and don’t overload people with too many facts and figures. Tools: Easel.ly, Visually or Picktochart. Instagram // Engage your people in making visual content to share! Every Sunday we’ve been asking people to take pictures with Instagram and use the hashtag #LiquidChurch and then we post those images to our Facebook wall. People come with with some pretty amazing shots … it’s fun to see our volunteers and guests get into the content creation action! SlideShare // You’re already making slides for your message this weekend … why not upload them to SlideShare and encourage your people to share them around. This is a fantastic way to reuse content that you’ve already made! Example. Have you posted some great examples of visual content on your Social Networks? Leave links in the comments … we’d love to see! Thanks for posting this article! I love it! I also have a question. What would you use if you want to create digital banners/slides for quotes and Bible verses? Scott … do you have an iPhone?